We are a Certified Bryant Dealer! Breedlove Dobbs Heating and Cooling is proud to be a Bryant Factory Authorized Dealer. We provide quality heating and air conditioning service, installation, and routine maintenance for the Indianapolis area. Growing a successful Bryant® dealership demands a steadfast commitment to Quality Products and Service, an unwavering dedication to Customer Satisfaction, and a daily demonstration of the highest level of Performance. The Bryant Awards program recognizes Bryant Factory Authorized Dealers (FADs) that have consistently done just that. Doing Whatever It Takes® to meet the requirements in Quality, Satisfaction, and Performance. The Bryant Awards program consists of three different levels of awards: Circle of Champions, Medal of Excellence, and the Bryant Dealer of the Year. 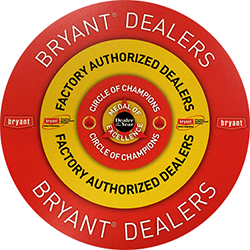 FADs that attain a pre-determined score on the Bryant Awards scorecard, who are compliant with all FAD requirements, and have at least three full years of Bryant purchases with the distributor are recognized as Circle of Champions. Circle of Champions that have the most points (by region and tier) are recognized as the fifteen Medal of Excellence winners for the year. Medal of Excellence winners will compete for the coveted Dealer of the Year title. FADs that have received the Medal of Excellence award at least five times are considered Pinnacle Award dealers. Through focus, determination, and leadership, Bryant Award winners have risen above their peers. They are true champions. In addition to being a Factory Authorized Dealer, we’ve been awarded the Medal of Excellence by Bryant. Each MOE winner has displayed a strong commitment to providing quality products and services while ensuring that their customers have the 100% satisfaction guarantee. In addition to being a Medal of Excellence winner, we are also a part of their Circle of Champions, a distinguished group of Medal of Excellence award winners. Want to learn more about what a Bryant heating and air conditioning system can do for you? We’d be happy to meet with you and give you a free consultation. Call us today at 317.888.9111 for all your heating and cooling needs!